In Paris, I’m attending Localization World, which is basically concerned with how to make money in other languages, or at least other cultures. Part of the backstage production involves how to get attendees from the conference venue to our cruise for dinner. We’re paying nearly 100 euros for this dinner cruise on Le Paquebot, supposedly the biggest ship on the Seine, so we’re expecting good service. There are busses all arranged, and I go down and find them outside the Palais des Congres without too much trouble. So far, so good. I jump in. It’s egregiously hot inside, and the Italian man across from me starts to complain. I run to the front of the bus and ask the driver to turn the air on. He obliges, and we’re off. We pass the Arc de Triomphe, and make our way to the Eiffel tower. We descend to a small quay and the driver stops. Everyone gets out. Unfortunately, where there should be a luxurious dinner boat, there is nothing. Everyone stands around waiting for something to happen. I go off to the nearest boat to see if maybe they’ve forgotten to put out the welcome sign for us, but it’s locked. By the time I get back, someone has figured out that we’re on the wrong quay. The bus driver is attempting to explain this in English, but it isn’t working very well. I step in, and he switches to French, pointing down to where the boat is actually waiting. I can’t go there easily in a bus, he tells me, but it’s a three-minute walk, just on the other side of the Parisian miniature of the Statue of Liberty. So I lead the crowd to the boat, where there’s a whole committee standing with plastered-on smiles and a strained look in their eye. We’re the first bus to make it to the destination, which is not a promising sign. We wait for awhile, and others trickle in, some on foot, some by way of the busses. Apparently, their busses got lost as well, but the drivers were able to work it out to close proximity. Soon, there is only one bus missing. Someone checks Twitter. There’s a tweet from a passenger: the bus has gotten stopped by the police because the driver was talking on his cell phone trying to work out where exactly the quay was. At this point, a group of passengers decided to take matters into their own hands, got off the bus in the middle of traffic, and started walking. In the wrong direction. Chastised by the police, but duly notified of where to go, the last bus driver escorts his remaining passengers to the boat. They get out. The welcome committee waits for the last twenty people or so, nervously checking the time. The boat is almost two hours behind schedule. It starts to rain. Ten more minutes, they say. We’re only waiting ten more minutes. The last twenty appear down the alleyway, dressed for dinner in their heels and ruffles. They approach, clop-clop-clop, and march down the gangplank, plunk-plunk-plunk. They are hungry, as is everyone else, but dinner hasn’t been served yet, because the boat hasn’t left. When it is served, it’s a bit sparse, although it’s tasty. 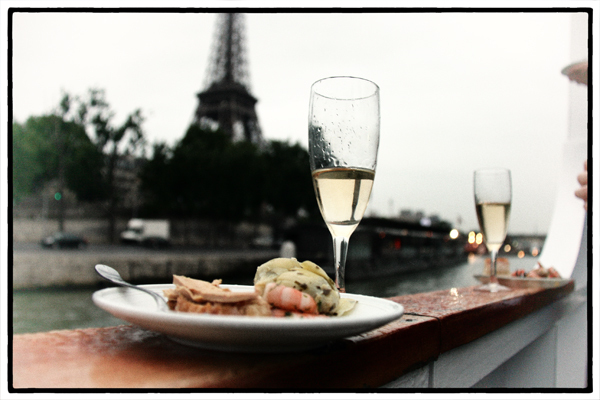 We float past Notre Dame, we float under the Pont Neuf, we have prolonged views of the glittering Eiffel tower. I decide that the price of entry must have been for the experience. Paris by night isn’t bad, even in the rain.